THE GENESIS OF THE APPAREL COMPANY OOBE, strange as it may seem, was an infomercial for the Psychic Friends Network, hosted by Dionne Warwick. It started a conversation about a different kind of “oobe”: an out-of- Bible experience. “That’s been our ultimate experience since we came to Clemson,” says Pereyo. They coined the word and began using it, and their friends picked it up as well. An “oobe” day for Merritt and Pereyo was the kind of day you’d have if you were going to skip class (not that they would recommend that) and go to Whitewater Falls. Or if you played ball at Fike and were hitting every shot. The kind of day that makes you feel like you’re doing what you were born to do. Fast forward several years. Both were married and working, Merritt as a high school counselor and coach in Easley with two small children, Pereyo in a corporate job in Charlotte with a baby on the way. “We recognized that we were entrepreneurs at heart, having grown up watching our dads either go from the bottom to the top like [Pereyo’s] dad in a real boot-strap-type story, and my dad had a dairy farm before getting into the landscaping business and figuring it out,” Merritt said. “So we both had this itch that we had to create and do something. Merritt can’t help but laugh when he recalls the one particular phone call on April 29, 1994, that served as their future-company’s first springboard. The window frame from that first office is framed and on the wall of the 105-B conference room. That phone call led to months of meetings at a Waffle House halfway between Charlotte and Easley, where they begin to imagine what OOBE would look like, crafting a business plan for what they saw as their niche: a segment of the outdoor industry that had to do with apparel. After a year, they handed in their resignations on the same day and moved into their first office: a rundown auto body shop in Easley that rented for $50 a month. That approach is no more conventional than the way they raised enough capital to move forward. When they were selling out of their cars to outdoor stores, Merritt began stopping by dive shops and selling scuba diving-themed shirts. It seemed to be a successful ploy, so they created “Dive Jive, the company that wants to go under,” with a series of shirts and hats sporting phrases like “Zero Visibility,” Deep= High and “Deep Thinker.” They went to the Jockey Lot in Anderson, bought tanks, a velvet Elvis, plywood and lava lamps, then drove to New Orleans and set up a booth at an international dive show. Sitting in the auto body shop, handwriting invoices on carbon paper, Merritt and Pereyo realized they needed help to move their company to the next level. They drove to Clemson’s Small Business Development Center with their yellow legal pad to meet with Becky Hobart (now Van Evera). When she asked to see their financials and their balance sheet, they handed her the yellow legal pad. The award paved the way for their first loan from the Small Business Administration, which enabled them to get over a bump in the road and on their way. The corporate offices of OOBE that overlook the Reedy River in Greenville are a far cry from the Easley body shop. But beginnings are important, and Pereyo and Merritt make a point of remembering theirs. The window from that first office is framed and on the wall of the 105-B conference room, a gift last year from their current OOBE family. The name of the room refers to 105-B Hollow Oaks Lane, the address of the body shop. They have no sales force, no business development staff. That money and energy, according to Pereyo, goes into the service strategy instead: treating people well and exceeding their expectations. They want to have partners, not customers, who will become storytellers and ambassadors on their behalf. “Our customers are our sales staff if we treat them well,” he says. It’s a philosophy that sounds like it reflects a small business with four or five employees, not one that outfits the employees of companies like Chick-fil-A, Krispy Kreme and Race Trac and has three offshore offices. They’ve known each other long enough and worked together enough that they finish each other’s sentences. Which is somewhat the secret of their success. They have a firm understanding that no decision goes forward that they don’t both feel good about. That leap, like most things in their company, comes with a story filled with self-deprecating humor. They had worked with Chick-fil-A in smaller ways, providing clothing for special events, when they found out the company had issued an RFP for uniforms. Have you every shipped to 100,000 employees before? Can you pass financial due diligence? Is this contract bigger than your whole company? “We changed the battlefield,” says Merritt. “We clearly focused on their team members, providing them a better product, leveraging performance fabrics, helping the team members feel better about themselves so they could provide better service.” That answer resonated with Chick-fil-A. 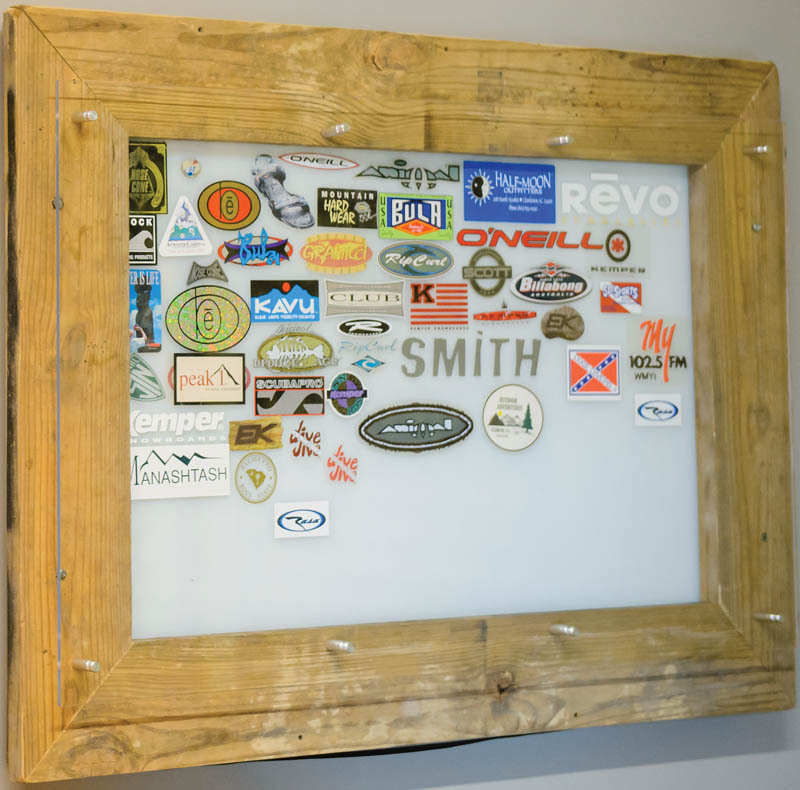 Chick-fil-A was followed by a number of other companies and organizations: a wall at the Greenville office sports logos of their clients including YMCA, BMW, Race Trac, Herschend Family Entertainment, among others. They’re deliberate about which companies they pitch: “We want to align ourselves with companies that value the same things we value,” says Merritt. OOBE hit its 20th year recently, and it was an emotional milestone. Neither Pereyo nor Merritt can (or wants to) imagine what it would be like to have gone it alone these past 20 years. In the company celebration, Merritt told the staff that it was their relationship and the support of their wives that kept them pushing the ball up the hill all these years. As they talk and tell stories, it’s clear that faith, family and friendship (plus humor) are all intertwined in their lives and in the story of OOBE, and there’s really no way to separate them. More and more often, they’re asked to share the story of their company and their personal partnership. Recently, they were invited to speak to the Clemson Alumni group in Atlanta. On the ride down, they were talking about the upcoming presentation.